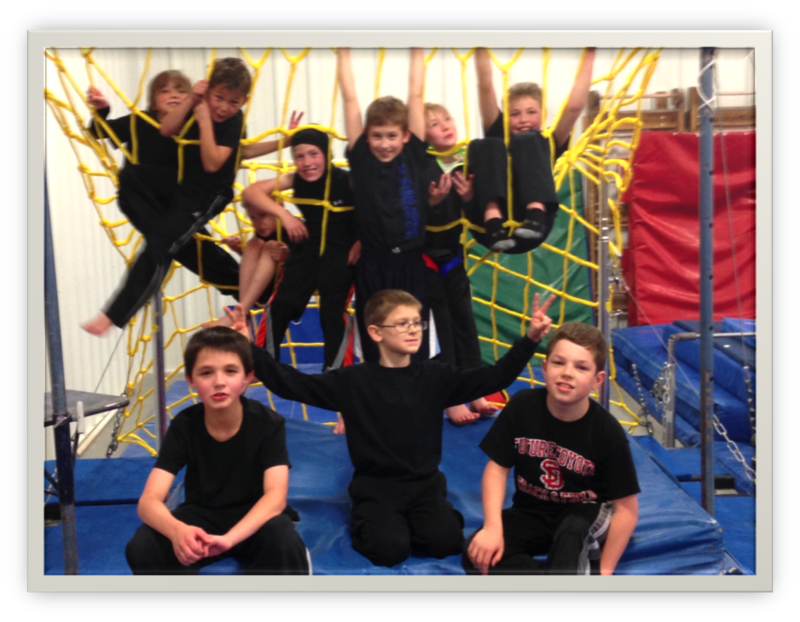 Exclusive to Just Jymnastics, this awesome class incorporates martial arts, gymnastics, and obstacle course training! Your child's ninja training, will include doing flips, rolls, and kicks. The gymnastics training and obstacle courses are both designed to improve coordination, build strength and increase agility. Beyond skill, this class teaches: self-confidence, discipline, impulse control, responsibility, and instinctual safety (how to roll when you fall). Required Apparel: Ninja Zone t-shirt and headband along with any of your own comfortable black shorts or loose fitting pants (no zippers or buttons). Awards Week: In December and May, we hold an awards presentation during class time. Every child will receive a ribbon based on his or her achievements! Ninja Mission: The Ninja Zone program consists of 4 levels: white, yellow, green, and blue. Each ninja in our program will begin in the white level and will advance at his or her own pace through the 4 colors of the program. After successfully completing all of the skills in a level, your Ninja will be invited to a Mission by their Ninja Trainer! We hold missions every six weeks to accommodate your busy schedule (Friday evenings or Sunday afternoons) and there is an additional fee of $20 to attend a mission to cover the cost of the new headband and wristband. Register here if your were invited to a NINJA MISSION or to sign up for the NINJA GAMES!